When it comes to garage doors, our team knows best. Read more about how it works and how we can help if it ever malfunctions. The average garage door is a combination of mechanisms working together to open and close a huge slab of wood, metal, or fiberglass panels that protect your home and vehicles. An opener, consisting of one of five types of drivers, is the main force behind the movement. One of two types of springs (torsion or extension) provides added force and counterbalance. Tracks and rollers aid the panels' direction when lifting and lowering. All of these pieces need to be in good condition to ensure that your door works well and isn't causing you any frustration. Mechanical failure can happen at any time, but we can get you back up to speed with our exceptional service. A motor, connected to either a trolley or torsion rods, slides the door along its tracks with the help of springs and rollers. Chain drives connect using a chain; the same goes for belt and screw drives. Direct drives are, naturally, motors that are directly within the trolley. A jackshaft is a motor that is connected to torsion rods rather than a trolley and is more often seen in commercial applications. Torsion springs mounted above the door store shear force while the door is closed that provides energy to open the door later, while extension springs stretch and coil instead. Without these parts, a garage door would be far too heavy to open. The force and counterbalance provided by the inner mechanisms are what allow your door to easily be lifted or lowered. To Fix or To Replace? A trained technician can tell you whether your part can be repaired or must be replaced to avoid further damage. As an example, springs should be replaced when they are worn because there is no way to tighten or repair the metal coils. Panels can often be repaired, depending on the damage. Our years of experience in this industry make us the perfect choice to repair any part of your broken door. 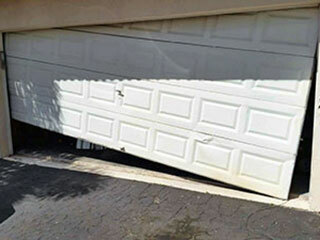 Contact Garage Door Repair West Jordan to make your appointment today.